Harley Davidson is an American motorcycle manufacturer that was founded in Milwaukee, Wisconsin in 1903. With over 100 years of experience, this company has become one of the largest motorcycle manufacturers in the world. Harley has developed some of the most iconic motorcycles of all time and is continuously improving and developing new products to hold up to their legacy. Harley has many models that all have their own distinctive traits. In this article, we will specifically talk about one of the most well known models, the Harley Davidson Softail. The Softail frame is designed to appear rigid and hardtail, but still offer the comfort of rear suspension. Tucked away under the transmission on models ’84-’17 are shock absorbers positioned along the axis of the motorcycle. On 2018 models, these shock absorbers are located under the seat. Historically, Harley Davidson offered springer leading link forks in addition to the different front fork configurations on Softails. These springer front ends were meant to resemble the sprung front ends used prior to the Hydra-Glide in 1949. The Harley Davidson Softail models did not have rubber-mounted engines, causing much more vibration on Evolution engined Softails. Later models used the counterbalanced version of the Twin Cam engine, followed by the Milwaukee Eight in the 2018 model. 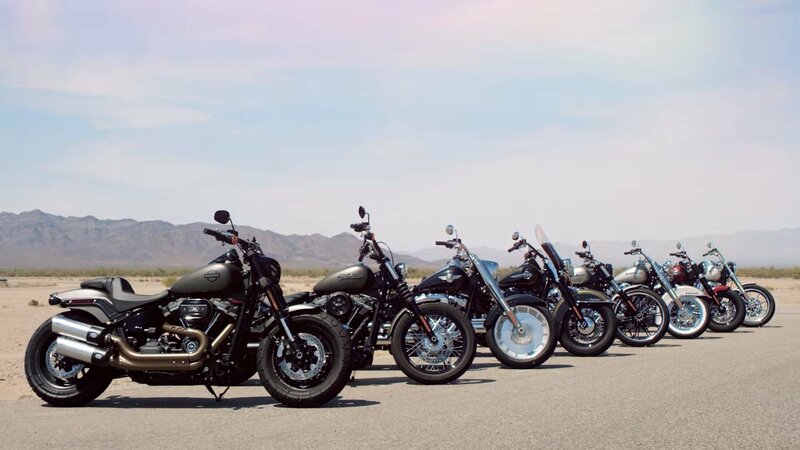 Harley Davidson offers several models with the Softail frame, including the Softail Standard, Custom, Springer Softail, Heritage Softail, Heritage Springer, Night Train, Deluxe, Deuce, Fat Boy, Softail Slim, the Dark Custom Cross Bones, the Dark Custom Blackline, and Breakout. In the mid-1970’s, Bill Davis designed the Softail. He began working on his first design in 1974. It had a cantilever swingarm that pivoted at the bottom and sprung at the top with the springs and shock absorber under the seat. In 1976, Bill contacted Willie G. Davidson and arranged a meeting. He presented what he built, a prototype based on his 1972 Super Glide. Six months later, Davidson replied to Davis stating the company would not be able to use the design, but was still interested. After that, Davis switched up the design and placed the pivot and springing points so that the springs and shock absorber were under the frame and the pivot point was at the top of the triangular swing arm. In January 1982, after a failed attempt to go independently as Road Worx, Bill Davis sold his patents, prototype, and tooling to Harley Davidson. In June of 1983, Harley introduced Davis’s design as the FXST Softail. The original FXST Heritage Softail rolled out with an 80ci Evolution motor in 1984. Bringing back the classic springer fork, Harley introduced the FXSTS Springer Softail in 1988. In 1990, one of the most popular Softails ever made was introduced. The FLSTF Fat Boy has a distinct meaty headlight housing, solid wheels, and floorboards. The Heritage Classic was introduced with full FL front fender, 1940s style leather saddlebafs with quick detach buckles and chrome wheels and hubs- all paying a special respect to the past. The FXSTD Softail Deuce was presented to riders in 1999. This lean and mean Harley has a long, slim tank, and sleek front end. The FXSTB Night Train was like nothing we had ever seen for the Softail before. The night train has a blacked-out powertrain and wrinkle black trim on engine covers, air cleaner, oil tank, rear fender supports, drive belt sprocket, and fuel tank console. The Dark Cross Bones went for the chopped bobber look. It has a springer front end, half moon floorboards, and a sprung seat. Next came the Softail Deluxe, and it was nothing like the Cross Bones. This bike can transform from a touring to a cruiser in a snap with its convertible components. In 2018 Harley introduced a completely redesigned version of the Softail frame. The frame used a different shaped swingarm suspended by a single rear shock absorber that’s mounted underneath the seat. They claim the new chassis is stiffer and lighter than the previous Softail. They’ve also canned the Twin Cam motor and replaced it with a Milwaukee Eight motor. As we’ve all heard the recent controversy, the Harley Davidson Dyna has been discontinued as some of its models have been carried over to the new Softail chassis. After seeing the dyno test results on the ’17 Street Bob with a 103 ci compared to the ’18 Street Bob 107 ci , it’s clear this bike has got some serious power. The 2017 Street Bob 103 ci was dyno tested and made 65 hp (48 kW) and 88 lb⋅ft (119 N⋅m) at the rear wheel. The new 2018 Street Bob 107 ci makes 77 hp (57 kW) and 101 lb⋅ft (137 N⋅m) at the rear wheel. The 114 ci motor such as in the 2018 Heritage Classic produces 81 hp (60 kW) and 108 lb⋅ft (146 N⋅m) at the rear wheel. Getting rid of the Dyna was a risky move on Harley Davidson’s behalf but this isn’t the first time we’ve seen one of our favorite models become discontinued. As much as a we hate to see the Dyna go, Harley Davidson is still meeting their main goal; to continue showing improvement and development in their motorcycles. Only time will tell if Harley has made the right decision on the Dyna models but we believe the new Softail frame will prosper in the motorcycle industry.